The LFS Graduate Student Council is hosting an LFS TA Training Orientation. This event is for new and returning TA’s for both Term 1 and Term 2. The Faculty strongly encourages any student appointed as a TA for LFS, in any capacity in the 2013/2014 year, to attend. The Orientation Day will also include an informational session run by the TA Union, CUPE 2278, which is mandatory for all UBC teaching assistants. The Orientation will have multiple facilitators, with the sessions run by TA Training graduate student coordinators (Bryanna Thiel and Dru Yates), CTLT facilitators, LFS instructors, and TA union representatives. **Morning coffee, lunch, and mid-afternoon refreshments provided. An informal opportunity to “put a face to all the names”, meet the new LFS graduate students and enjoy some lunch! There will also be two short information sessions. Meet our new & incoming graduate students, award donors, Graduate Advisors, faculty, colleagues, and the Faculty of Graduate Studies Staff! Enjoy vegetarian and non-vegetarian food! Graduate Student Orientation is a joint offer by UBC Faculty of Graduate Studies, the Graduate Student Society (GSS), International Student Development and and the Office of the Vice President, Students and is highly recommended for all new graduate students as they provide an opportunity to meet your fellow new graduate students and learn important campus and academic information. Orientations take place 2-3 times per year. The largest Orientation event happens just prior to the Labour Day weekend and is a week full of activities and events welcoming both local, national and international students to UBC and Vancouver. Winter orientation is an afternoon session offered each January for all students. International student development host an orientation specific to international students in August/September, January and May. Please visit the event website orientation.grad.ubc.ca to view a schedule of events, location maps, pictures of previous events and much more. 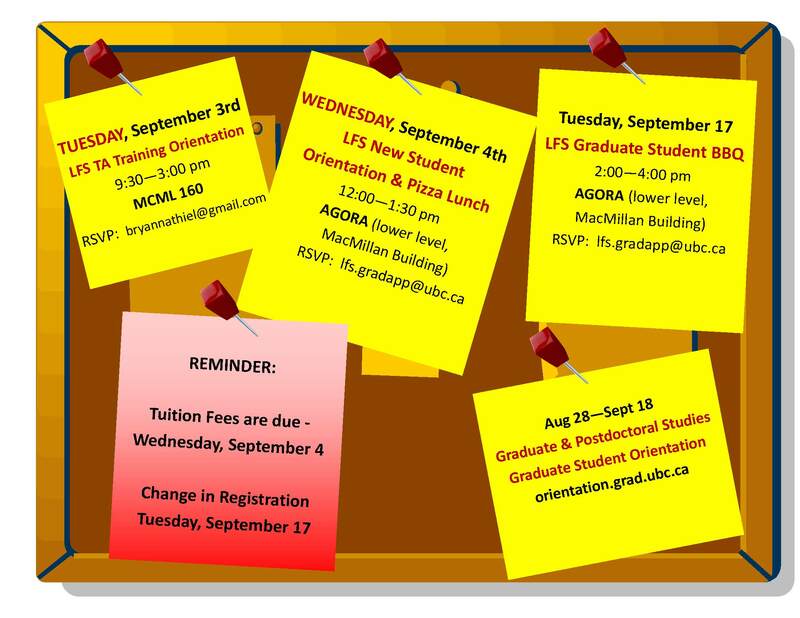 Posted in Events, Latest News and tagged events, orientation, TA, training on August 20, 2013 by lfsgradmgr.